In 2005, Human Rights Watch investigators traveled to camps along the Chad-Sudan border of refugee men, women and children from Darfur. During interviews with these refugees, Human Rights Watch investigators gave children paper and crayons to keep them occupied while they gathered testimony from the children’s parents and caregivers. 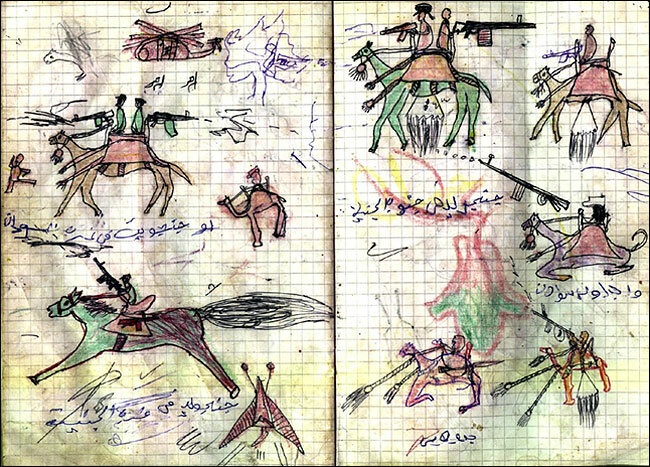 Over the following weeks of the investigation, these violent scenes were repeated in hundreds of drawings given to Human Rights Watch, depicting the attacks by ground and by air. Children drew the Janjaweed over-running and burning their villages and Sudanese forces attacking with Antonovs, military helicopters, MiG planes and tanks. The drawings corroborate unerringly what we know of the crimes. From the lens of humanitarian law, the drawings illustrate a compelling case against the government of Sudan as the architects of this man-made crisis in Darfur. This is my interview with human rights researcher and lawyer for Human Rights Watch, Olivier Bercault. Karim: How did you get started as a human rights lawyer? Olivier: As a young human rights lawyer in France, I started out working with immigrants and refugees in France. Since then, I have worked in many different countries on human rights issues, primarily for Human Rights Watch but also for the United Nations. My work has taken be to many different countries and often in the midst of war zones, including Iraq and Afghanistan, Algeria, Rwanda, Central African Republic and Sudan. I have also been to Chad many times and am leaving for Chad today. Karim: Is there any preparation you have to make for a war zone assignment? Olivier: While I was in with the U.N. they dispatched me to a training facility in Jordan – in the middle of nowhere in the desert. This was a simulation exercise which included actual bullet and bomb deployments just like in an actual war. This training was very helpful in my future exposure to war impact areas. One of the most important skills I learned here was to check for car bombs – which is often a tactic deployed against journalists and human rights workers – as is kidnapping. “Look – I am a Franco-American!”. I was living in New York and so I played up the American connection which, in this case, got me off the hook and they freed me. Karim: So, not being intimidated is vital to survival in these war-torn countries where there is often a lot of lawlessness? Well, of course – it was bluff. While it was true my boss was scheduled to call me at 7pm, it was highly unlikely that he would have the power and influence to dispatch a swat team in the middle of Africa. But the low-level army thug now had sufficient doubt planted in his mind and so he was now concerned about his own boss if things went wrong. So, he let me go free. Karim: What is the essential function of your work and what is the primary impact of your work? Olivier: The essential function is the research and recording of human rights violations. At Human Rights Watch, we do original research and do not work with secondary sources. As a result, our research has a reputation and credibility that is respected by both journalists and policy-makers, who seek us out for original source material. As a result, I will often find myself testifying before governmental panels or before commissions of the European Union; or, as I did recently, having dinner with Nicholas Kristof of the New York Times to update him on the latest human rights research I have been conducting. Karim: What are the fulfillments and the challenges of the work you do, to you personally? Olivier: A very fulfilling component is the ‘trickle-up’ effect of the human rights research I conduct. I have the satisfaction of representing those who have been victimized have their stories told in a way that trickles out and is disseminated by the news media. Collectively, the dissemination and awareness-raising trickles-up to the policy level whereby real change can be implemented. For example, when I was working to document the genocide in Darfur in the early days, I could see aspects of this violence spreading – ‘spillover violence’ – through what we call ‘The Death Triangle’: Sudan, Central African Republic and Chad. By alerting journalists and policy-makers of the escalation of violence in the early stages, you have the fulfillment of being part of the preventative solution. That is the fulfilling part. Karim: And the challenging part? Olivier: Like in many similar professions, there is always the challenge of compassion fatigue and becoming overwhelmed by the pain and anguish of others. Particularly when you are exposed to the site of mass graves and wanton violence, or, when you see little children suffer. Karim: Tell me about the children you encountered in Darfur and the drawings they did? Olivier: I was in Darfur to conduct interviews with parents of children who had witnessed extreme violence at the hands of Janjaweed militia. On one of my trips there, I was accompanied by a Dr. Annie Sparrow, who had the foresight to bring along supplies of color pencils and paper for the children. While I was busy interviewing the parents of these children, the children, unbeknownst to me, spontaneously started to draw their experiences of the violent episodes. Karim: What are some examples? Olivier: Several drew colorless bodies, often bodies lying upon their stomachs. When I asked what these represented they responded that these were dead bodies they had seen. One child drew a person and colored the person’s head in red. When I asked what that represented she said it was someone she saw who had been shot in the head and killed. Karim: Do you think these drawings were a form of release for the children from PTSD? Olivier: Definitely. The drawings were a “safe zone” for them to express their thoughts without being concerned about verbally explaining what they had witnessed. When they finally did talk about the horrors they had seen, they were doing it in the form of describing a drawing they had done – it was an easier forum for them to express themselves in. Karim: I wish you the best for your upcoming trip to Chad. What is the purpose of your trip there? Olivier: I shall be documenting the experiences of victims of violence in Chad some 20 years ago, who are now finally feeling courageous enough to come forth and tell their story. It sometimes takes a long period just to embark upon the long journey of healing.